Incident Details: A lady out walking came across a 70 year old gentleman, who was suffering from a “racing heart”, and was obviously unwell. She raise the alarm from the hotel at the bottom of the hill. The Team set off to Rosthwaite with two vehicles full of personnel, and checked on the availability of the air support, given the symptoms displayed. 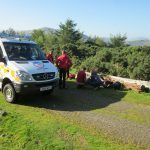 Initially, it looked as if no air ambulance would be available, and as the casualty was some way up the hill, the Coastguard helicopter from Caernarvon was requested. Fortunately, Helimed 58 became available after the job it was on was dealt with, and was able to land reasonably close to the casualty site. Team members then stretchered the gentleman to the aircraft, and he was flown to the Cumberland Infirmary for treatment. The Team stood by until the aircraft was airborne, and then the Caernarvon aircraft was turned round, and the Team returned to base..
13 Team members – 1 hour 35 minutes.